Stevia kills lyme disease pathogen better than prescription antibiotics. morphological forms of Borrelia burgdorferi. At present, the CDC acknowledges that at least 300,000 are infected with Lyme disease annually, with the conventional standard of care relying on antibiotics that are not only toxic but increasingly coming under scrutiny for addressing only surface aspects of the infection, often leaving antibiotic-resistance Lyme disease deep within the system to continue to cause harm. B. burgdorferi has a complex life cycle, and can exist in radically different forms: spirochetes, spheroplast (or L-form which lacks a cell wall), round bodies or cyst form (which allows for dormancy and escaping PCR detection), and highly antibiotic-resistant biofilms. This pleomorphic property makes conventional treatment exceptionally difficult because while some conventional antibiotics are effective against forms with a cell wall such as spirochetes, they are ineffective against those without a cell wall. This enables B. burgdorferi to change form to evade eradication through conventional means. Also, biofilm formation creates a significant barrier against most conventional antibiotics, even when used in combination, and has been recently suggested to be the most effective mechanism of resistance. 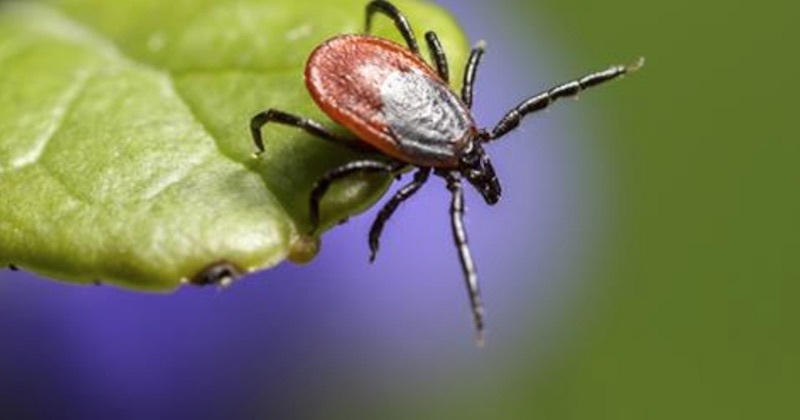 The study pointed out that, according to the CDC, about 10-20% of Lyme disease patients treated with antibiotics for the recommended 2-4 weeks experience adverse health effects, such as fatigue, pain, or joint and muscle aches. In some of these patients, the adverse effects last for more than 6 months. These patients are often labeled with “chronic Lyme disease,” or “post treatment Lyme disease syndrome.” While the adverse effects of antibiotics, including their destruction of beneficial microbes in the gut, may account for this syndrome, another possibility is that the drugs drive antibiotic-resistant forms of the disease deeper into the system, resulting in enhanced disease-associated malaise. 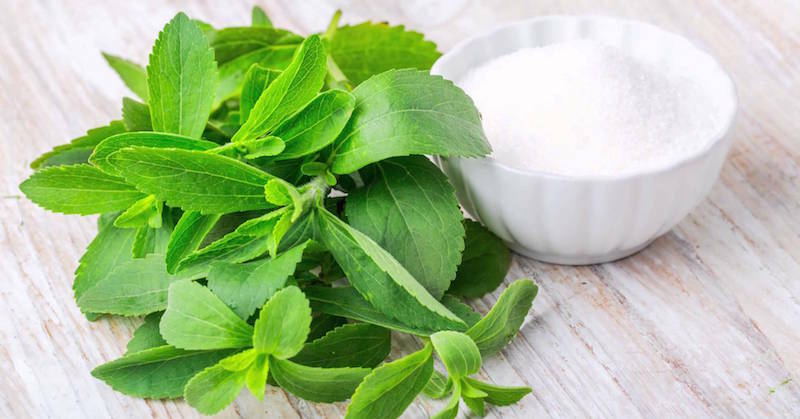 The leaf extract of Stevia possesses many phytochemicals, which include austroinullin, β-carotene, dulcoside, nilacin, rebaudi oxides, riboflavin, steviol, stevioside, and tiamin with known antimicrobial properties against many pathogens [40, 42, 43]. The role of these compounds is mainly to protect the plant from microbial infection and adverse environmental conditions [38–43]. Stevia may also help individuals who are trying to quit smoking. The susceptibility of the different forms was evaluated by various quantitative techniques in addition to different microscopy methods. The effectiveness of Stevia was compared to doxycycline, cefoperazone, daptomycin, and their combinations. 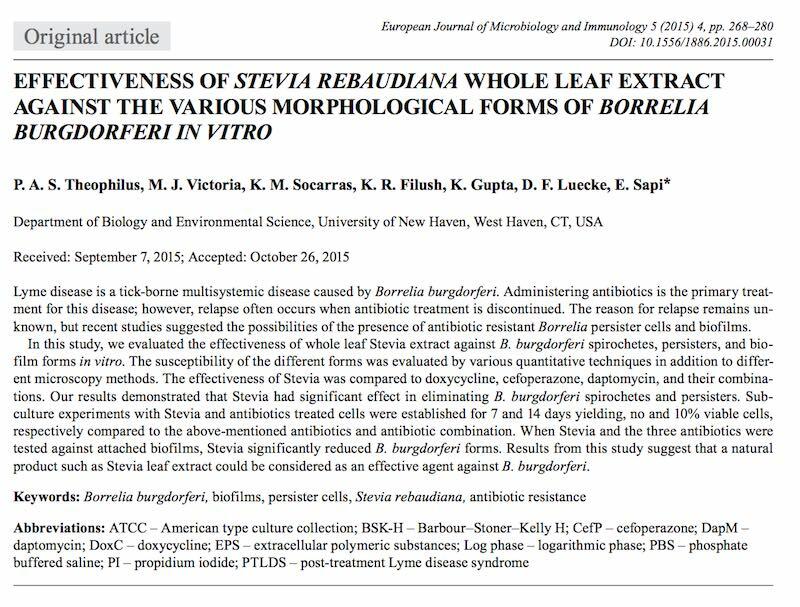 Our results demonstrated that Stevia had significant effect in eliminating B. burgdorferi spirochetes and persisters. Sub-culture experiments with Stevia and antibiotics treated cells were established for 7 and 14 days yielding, no and 10% viable cells, respectively compared to the above-mentioned antibiotics and antibiotic combination. When Stevia and the three antibiotics were tested against attached biofilms, Stevia significantly reduced B. burgdorferi forms. Results from this study suggest that a natural product such as Stevia leaf extract could be considered as an effective agent against B. burgdorferi. It is also interesting to note that the stevoside extract, by itself, was not found to be an effective antimicrobial agent against B. burgdorferi; nor did it have any effect on resistant cells. Mass market stevia products, including Coca-cola’s Truvia (ironic branding, considering it does not have the truly therapeutic property of whole stevia), would not, therefore, have the medicinal property associated with the whole herb extract. This speaks, of course, to the well known principle in natural medicine that the activity of the whole can not be reproduced through a part, nor is the therapeutic activity of the whole identical to that of the sum of its parts. While this is only a preliminary study and should not be interpreted to mean the consumption of whole stevia extract will result in clinical improvements comparable or superior to conventional antibiotics, it opens the door to future research on the topic. That said, anyone who is considering natural ways to prevent Lyme’s disease infection, or to support as an adjunct therapy conventional treatments of the disease, could utilize this safe, food-based substance as a potential means of support and synergy. Certainly, there is little, if any, indication that stevia could cause harm, unlike conventional treatments. See the Stevia Research Section from GreenMedInfo.com for more information.